Baskets are versatile and can be stunning when well-grown. Baskets can be grown in the overhead space in the greenhouse. 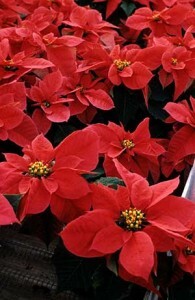 Don’t use too many baskets, however, as the poinsettias below them will suffer from too low of light. Consumers typically place the baskets on pedestals or use them as table centerpieces. Two styles of baskets are available – with and without plants growing from the sides of the baskets. The latter make a full, dramatic plant as the basket is mostly hidden, but require more cuttings. Choose cultivars with strong stems and bracts that hang down to create the ball of color effect. Schedules will be to 6 ½ inch pinched plants as you don’t want the plants too tall. Hanging baskets with plants on the sides need to be handled carefully during transport.